There are some things in life I just can’t live without, and that’s a decent skincare arsenal. Here’s mine, stripped down to a bare minimum. 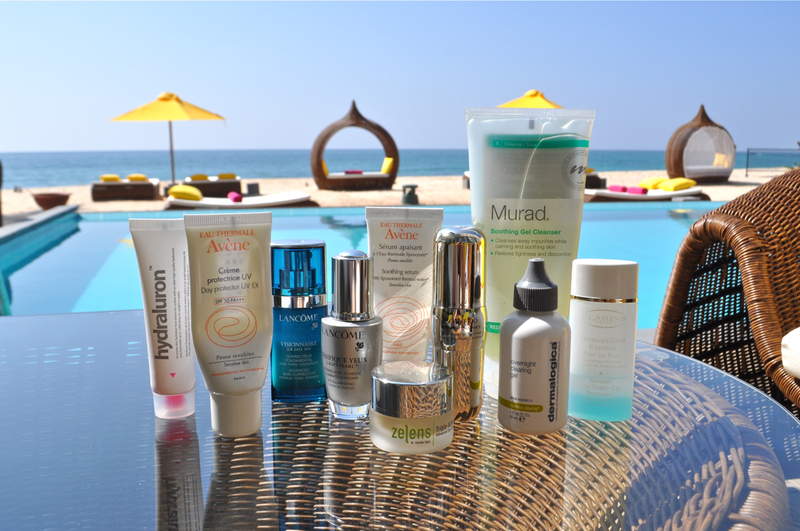 These are all I need to keep my skin happy during a short getaway. Bare in mind that this is just what I packed for a couple of days at the beach so I haven’t included a heavy duty cleanser as I’m not wearing much other than a concealer and brows. Somedays I do a little eye liner, but that’s about it. To me a good skincare routine includes an effective cleanser. For now I’m relying on this one by Murad. I’ve repurchased this and it’s been my go to cleanser for the last 5 years or so. It’s their Soothing Gel Cleanser formulated for sensitive skin. The texture is very light weight and jelly like. It doesn’t foam much but cleans my face without stripping it of all moisture. Skin feels comfortable and bouncy. I use this morning and night. 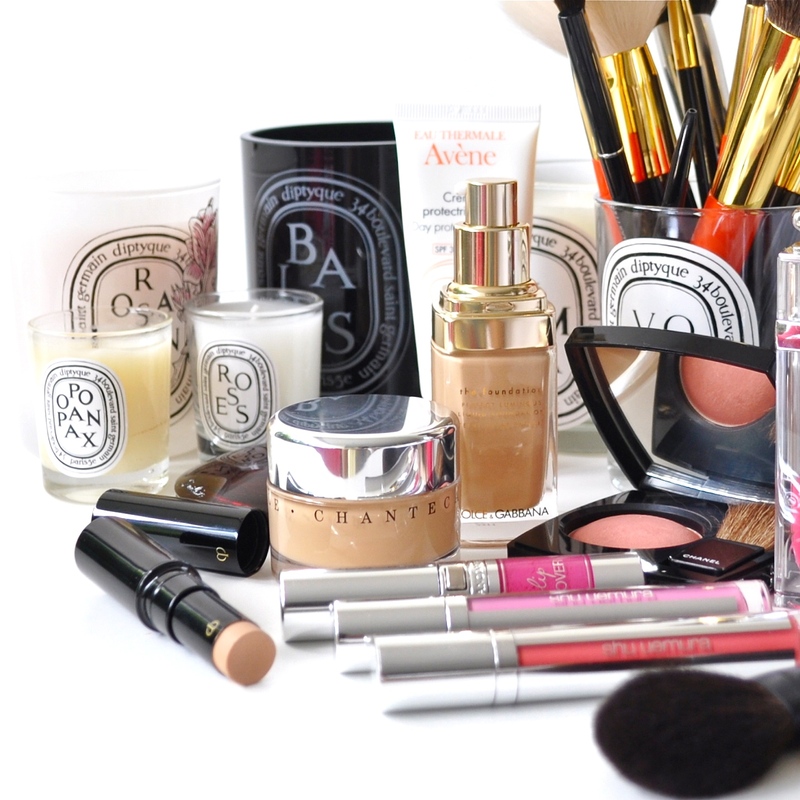 If i’m wearing any eye makeup, I use the Clarins Instant Eye Makeup Remover to cleanse it off at the end of the day. I pack this smaller travel size bottle and it doesn’t take up too much space in my travel pouch. For speedy eye makeup removal (even waterproof mascara) without any sensitivity I highly recommend this one. After cleansing, it’s moisturiser and sun screen. No matter how humid or sweaty the weather is, it’s a non negotiable step. Ideally with my extra oily t-zone, i’d happily go without moisturiser, but since it’s something I don’t compromise on, next best thing is my Hydraluron hydration serum. It gives my skin a burst of moisture and absorbs immediately leaving NO oily feeling. 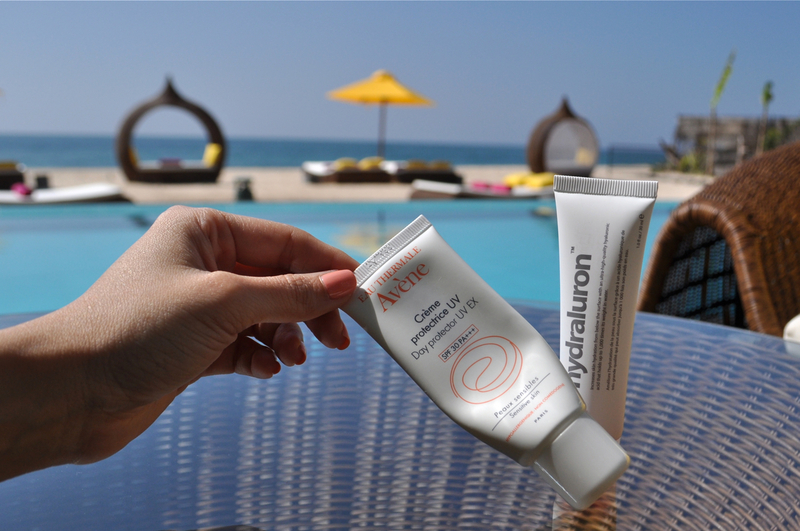 I then follow with my daily sunscreen which is the Avène Day Protector UV EX SPF 30 PA ++++. I like that it’s formulated for sensitive skin and also absorbs well into the skin leaving it velvety and supple. Again, no oiliness. On the down side, I am convinced this blocks my pores. But until I find something as good as this, it’s a necessary evil i’m willing to put up with. Sigh. For eyes I always, always use an eye cream. 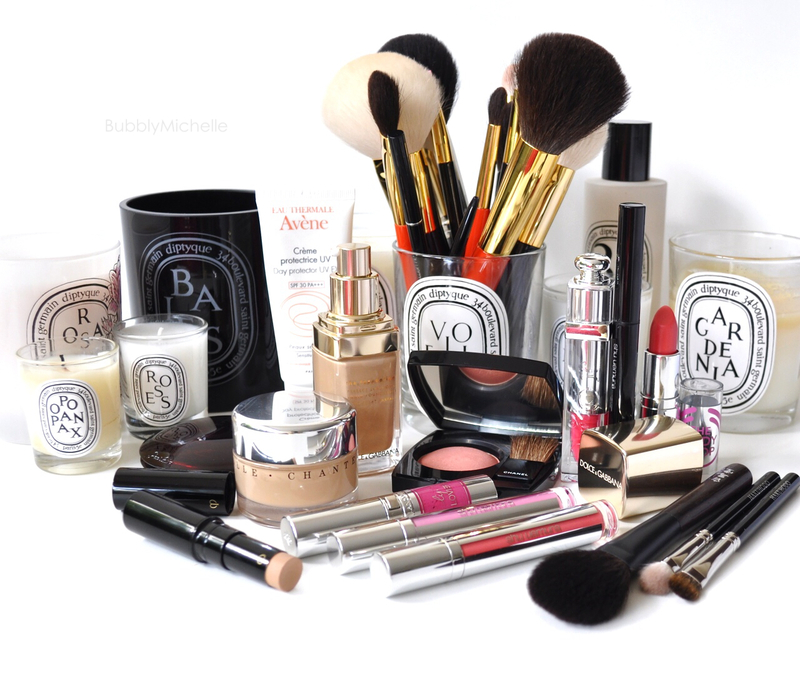 Even during the day, under makeup, I use one. For travel I mainly pack these three. One serum and two eye creams. For the ultimate line busting solution, my go to is the Zelens Triple Action Advanced eye cream. It’s a light gel texture and feels amazing on the eye area (for those of you who have very dry under eyes or love richer night creams, this one will feel rather under nourishing as it absorbs completely). Usually I apply this after I have prepped my under eye with the Lancôme Génifique Yeux. Which is a serum that absorbs immediately and leaves no greasy feel under the eyes. The reason I pair all my eye creams with the Génifique Yeux is that I notice it boosts the anti aging benefits of my eye creams and I love it. For nights I prefer to alternate my Zelens eye cream with the Shiseido Bio-Performance Super Corrective eye cream. This is my holy grail hydrating/anti-aging eye cream. Although it’s not as effective on deep, stubborn wrinkles (compared to Zelens) I love it for how hydrating it is. It actually does an amazing job hydrating so I always repurchase this. If you don’t have any major wrinkle issues and/or in the mid 20’s to early 30’s this is the one for you! It keeps eyes looking bright and youthful as well as controlling the appearance of any new fine lines. 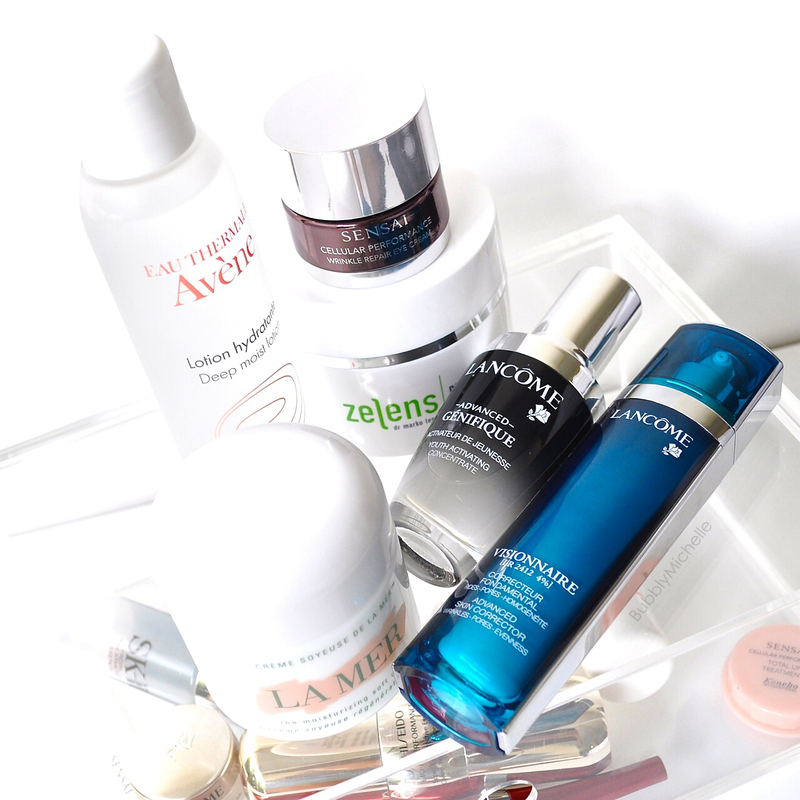 The one thing I NEVER ever leave home without is my Lancôme Visionnaire Serum, reviewed here. It’s been my holy grail serum for the last three years or so. If uneven, blemished skin with noticeable pores are your concern. This is what you need. 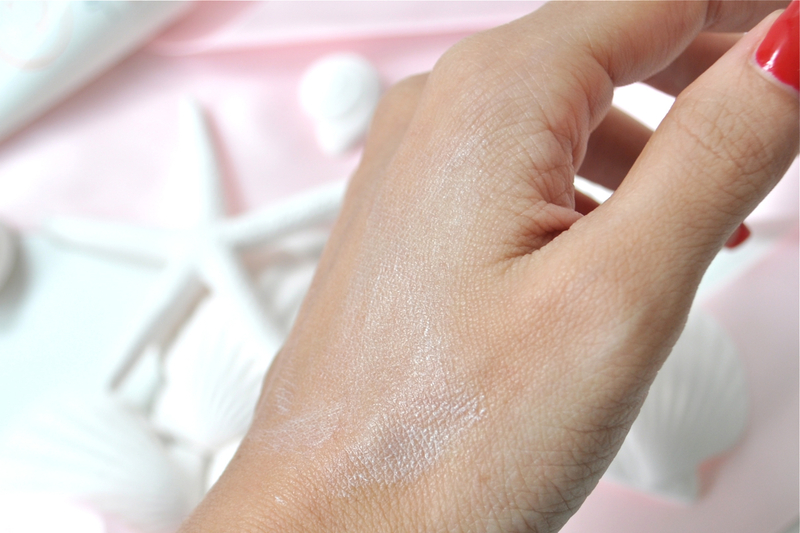 It will make your skin look rested and glowing overnight. I have several of these at home, including this tiny version I use when I travel. Lastly, I also pack two SOS treatment products where ever I go. One is the Avène Soothing serum. It’s what I rely on when my skin feels sensitized and red. If you suffer from sensitive skin, this product is gold. It instantly calms angry, red blotchy skin. My second SOS product is the Dermalogica Overnight Clearing Gel. It’s god sent for banishing those pesky, holiday ruining breakouts. Apply this at the very first sign of a blemish and you could control the breakout as well as enable it to heal without leaving any discolouration or marks. Certainly a product worth investing in. So there you have it. My skincare essentials for travel. They all fit into a relatively small pouch so by no means is it a burden carrying them around. And at the end of the day, my little bag of magic comes equipped with everything I would need for any holiday emergency! A couple months back I was on the look out for new sunscreens to prepare for the hotter months that were to come, so I got busy and was scoring the makeup counters and drugstore aisles for suitable contenders and been busy testing them since. Now I am someone who’s new to wearing daily protection (been only at it for around 2 years now). Mostly since I hate having to add ‘yet another layer’ on to my face before I do my makeup.. It really is a pain to be honest, and on most days it’s moisturizer, followed by sunscreen and then primer! By the time I get to my foundation, my skin is looking so oily I just want to puke! So far I’ve tried a few (La mer, 3Lab etc..) , and the one I’ve enjoyed before this is by Clarins which is a very light weight sunscreen that I was somewhat happy with! However I did still notice a slight oiliness that I wasn’t entirely thrilled about. These days I only use it when I need very high SPF, like if I’m going sailing. The Clarins one comes with a whopping SPF40 and is very lightweight for such a high protection level. 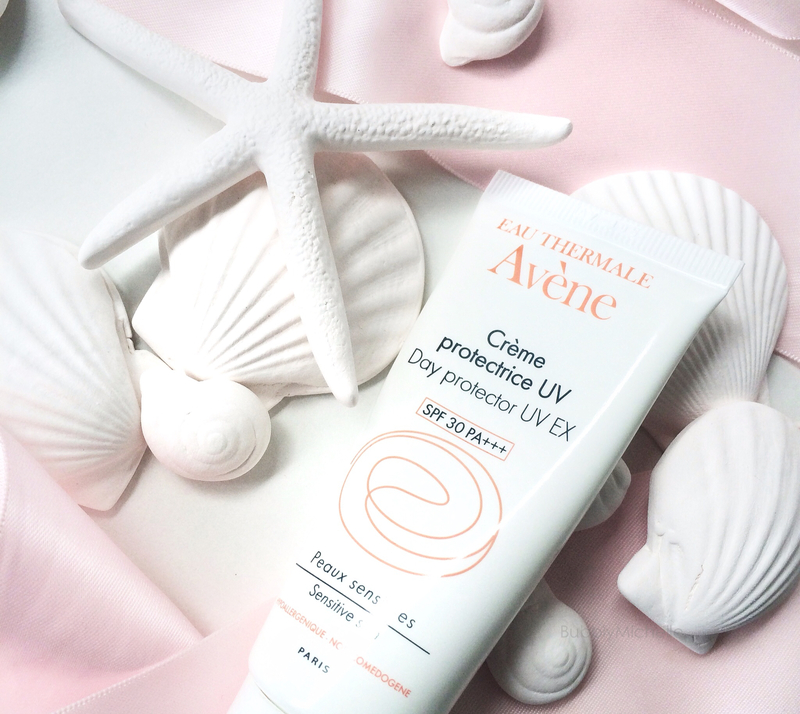 For day to day use, my current favourite is this one by Avène with SPF 30. 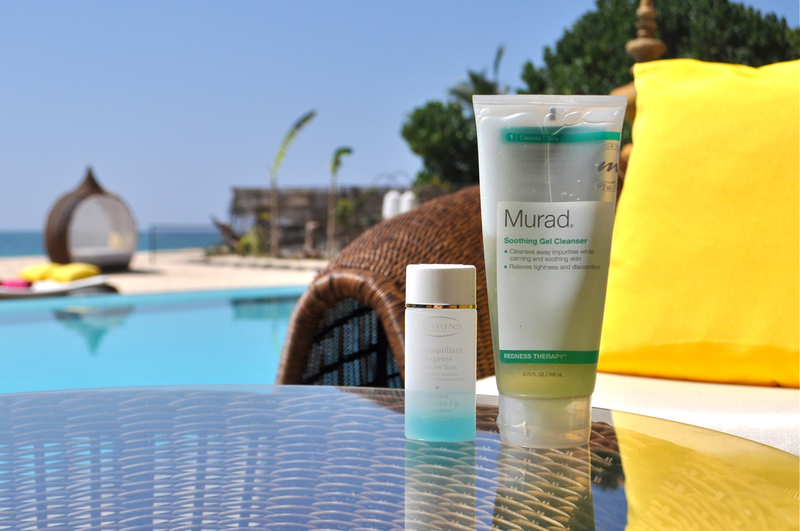 It’s one sunscreen that leaves ZERO oiliness on skin and completely absorbs in. I also really love the soft scent of Avène products which is soothing and never overwhelming. For those who like to go bare faced with no makeup (lucky you btw) this is perfect as it leaves no white cast, a tell tale sign of sunscreen use. I love that it’s pretty discrete in that sense and it’s something that I always look for in my daily sunscreen. So for application, the amount I squeezed off the tube is not quite enough, I believe double that amount is best, and I promise you it won’t feel heavily on your skin. 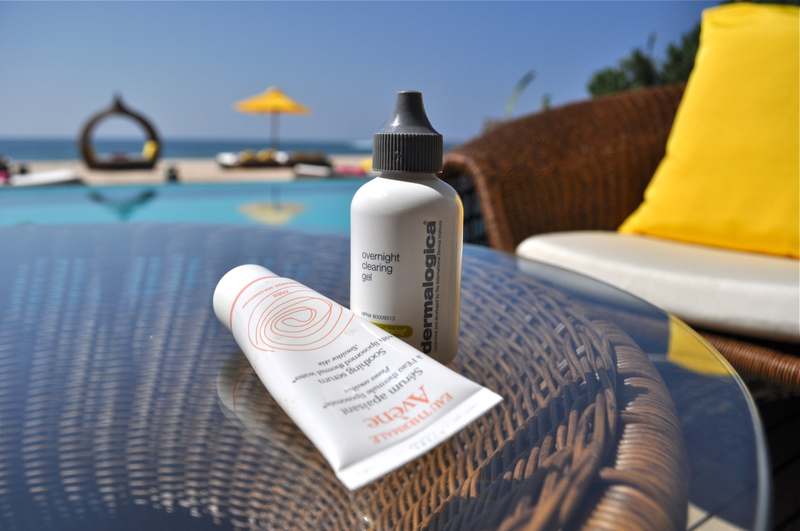 This sunscreen absorbs into your skin quickly and leaves skin feeling slightly moist and soft to the touch. No tackiness. The best way to describe it’s texture is of a light moisturizer, the type they market for normal to combination skin types. Basically this does NOT feel like a sunscreen at all. As all Avène products, this too is made specially for sensitive skin types, and as a regular user of Avène I can vouch that they have never caused any irritation (I have sensitive skin btw). I really like that something so effective is found in drugstores and if you happen to have access to French pharmacy brands, I highly recommend you try this! It comes with 40ml of product and I believe retails in the range of $45-$55 (SG dollars) I purchased mine a while back, so I can’t quite recall the exact price. Will recheck and update it here soon! I purchased mine from Watsons Singapore. Thank you for reading and I hope you have a great week! Another month gone! So it’s time for a favourites post. Yeah thooooose patchy entries lol! So this month was pretty much mostly about lipstick. Nearly every brand I loved, released one form or the other of liquid lipsticks. Matte AND gloss versions! Apart from the lip products there’s also new base products I’ve been trying out as well.. so read on and I hope you like the mix of things I plan to share with you today! The Shu Uemura Tint in Gelato sticks which were the first to release. They are a matte liquid lipstick formula that can also be used as a cream blush for cheeks. In general I am not all for matte lipsticks as they can be pretty drying and uncomfortable to wear. However I feel the Gelato sticks are something in between matte and cream lipsticks and are of a whipped texture. They aren’t drying and don’t have that extreme matte feel. Next to release were the Dior Fluid Sticks. A hybrid between gloss and lipstick. This wore with an intense shine while at the same time packing on some serious colour! I found the feather light formula comfortable to wear and was quite long lasting (as far as gloss lipsticks go). And if you have a weakness for red, as do I, this collection is heaven sent. The last installment of the liquid lipstick was the Lancôme Lip Lover. They just released in May but I had the opportunity to sample them before they hit the stores. I felt they were very well pigmented lip glosses and not necessarily lipsticks. The one thing that stood out though was that they looked so juicy when applied. My lips looked plump and lip lines were visibly reduced so they looked more luscious and ‘kissable’. I also loved how the colours mix well together and you could do a no fuss ombre lip with these in 30 secs. Apart from the liquid lipsticks I also enjoyed #18 Colour Crush Shine lipstick by The Body Shop. It was a perfect non fussy lipstick (coral peach) for everyday use, which didn’t break the bank. I’d highly recommend that one if you are looking for something new to try. I am very happy to say that I think I may have found the perfect foundation for myself colour and finish wise. 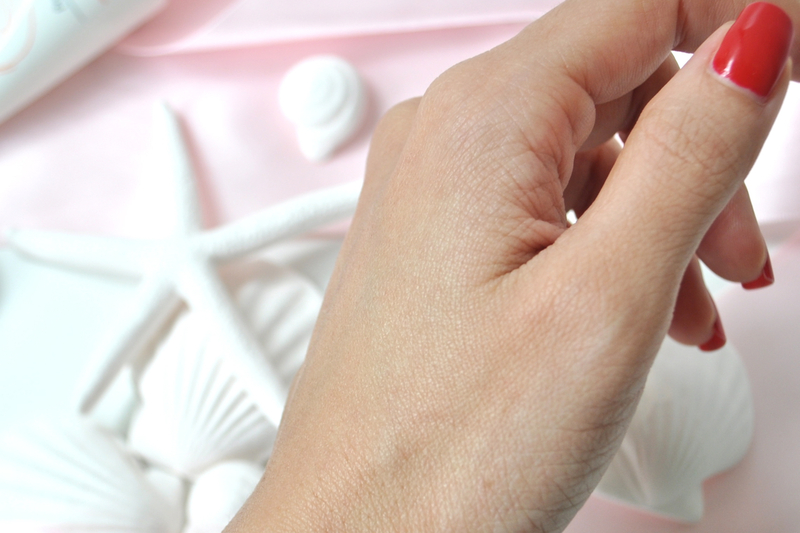 The Chantecaille Future Skin foundation. I really love how light the texture is and that it looks soo skin-like. There’s no way anyone would detect this on your face EVER! And given that I find it soo darn hard getting a proper foundation colour match (without having to mix two shades). I was ecstatic that the shade Chamomile matched perfectly. It’s an oil free water based formula, so it doesn’t add to an already oily situation which we deal with in hot weather like this. What’s more, it’s specially formulated to keep skin feeling hydrated all day! 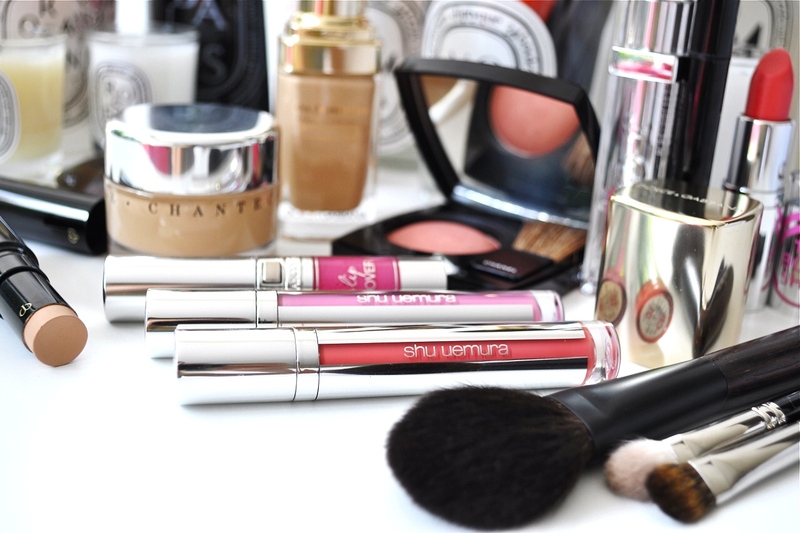 So your makeup stays looking fresh throughout. Another excellent new find is the Dolce & Gabbana Perfect Luminous foundation. This is a more fuller coverage foundation compared to the Chantecaille one. I love the smooth finish and it sits on the skin well. It also doesn’t oxidise on me and is perfect for mixing with Future skin if you want higher coverage with a more skin like finish. Both wore very well, although blotting was inevitable around the 4-5 hour. And finally onto something I’ve been steadily using since January but never did a full review on! The amazing Clé de Peau concealer. This is the best concealer I have ever tried. And I love it for the undereyes as so far nothing I’ve tried has managed to achieve such opaque coverage with a lightweight formula. It’s slightly on the dryer side so I recommend never skipping eye cream when using this. One of the pluses of a dryer formula is that they don’t slide around and migrate as your day goes on. It stays put. Although many claim that this doesn’t settle into lines, I find that it does. Minimally though. Maybe cos my two wrinkles are pretty deep >.< Anyhow, overall I am in love with this and would recommend it to everyone who is on the look out for a good concealer. On the downside, it’s not the most wallet friendly option! Come Spring/Summer I start including my trusty old Guerlain Terracotta bronzer in my daily routine! This little fella and I go a long long way back. Been almost two years now and we still love each other very much. If you are looking for a bronzer without that evil orange undertone, you need to stop by the Guerlain counter. They make the best. I use this to warm up my complexion whenever I tan so that my face matches my arms. My current shade is 03, meant for beige complexions (01, 03 are for warm undertones and 02, 04 are for those with cooler undertones). Unless you are very fair, the shade 01 might be a little too light of a bronzer. I feel many could get away with 03 depending on how much product you use in one sitting. I actually need only a very little to warm up my face as this is a significantly dark shade. But the slight satin finish and the weightless formula is undetectable and I love that about it. Another good one to try is the 4 seasons bronzer by Guerlain which was a newer addition to its range of permanent bronzing powder products. On to more powder products that I have been loving lately, this gorgeous Chanel Blush in the shade In Love. I totally forgot to take a close up of this beauty but it’s a blush that would universally flatter warmer skin tones. I love this satin peachy beige, as it pairs extremely well with smokey eyes or on days when you want to go for a natural look. Now moving on to a few eyeliners that made it into my HG products. The Shu Uemura Calligraph:ink liner and the Long Lasting Soft Gel Pencil. Both are incredible as far as pigmentation goes. The blackest black I have ever seen. I have tried many drugstore and high end liners and they don’t even compare to these. Pure love! You can read more about this product in a comparison review I did a few posts back. And finally as we near the end of my favourites post, I want to sneak in this new UV protection I’ve been trying. It’s by Avène. Their Day Protector UV EX which has SPF 30 . Possibly the best sunscreen I have used as far as texture goes. I love that it feels more like a moisturizer than a sunscreen and absorbs easily without leaving any oily residue. A full review on this will be up hopefully by next week. Just in time for you to stock up on sunscreen for Summer! So last but not least brushes! I know some of you love brush reviews so here are a few that I’ve been really enjoying this last month. All are new brushes from my last Hakuhodo haul. Initial entires here and here. First up is this magnificent brush, the Hakuhodo Kokutan blush brush H2282. Possibly the most luxurious brush in my possession. And yes! Love it more than the Tom Ford one. The soft bristles are tapered and apply blush with the lightest feathery stroke. Although I looks similar in shape to the Chikuhodo Z4 I find this one a tiny bit smaller and a very good size for my face. Between the two if I had to pick, it would be the Kokutan brush, as it has a softer, lighter touch. Apart from performance, it’s very hard to ignore the beauty of a wooden handle with signature carved Japanese lettering. Just a work of art. I will most certainly be buying more of those! Second up, no surprise here, is the J5523. The work horse of my brush collection. This is actually the second one I purchased and I use them everyday! 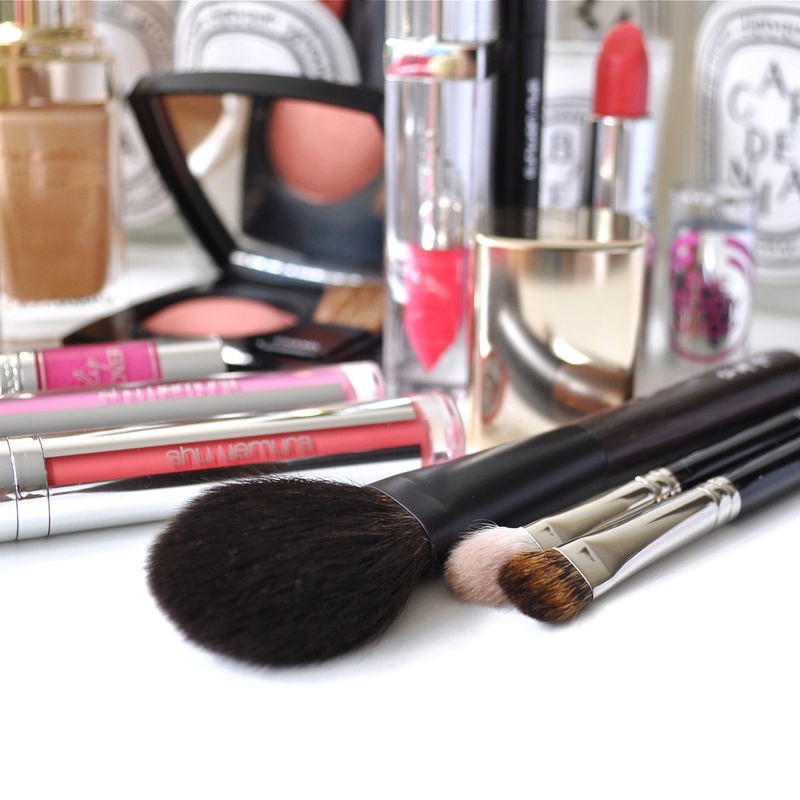 It’s so easy to use and is very soft and blends all eye makeup without causing any irritation. If you love your Mac 217, then this is something you need to try. It’s the Mac 217 on steroids! Lastly the final final favourite of the month, the Hakuhodo B133 a flat eye brush made of Canadian squirrel hair. This is used for placing and building up eyeshadow on the lid. I really love it for it’s impossibly soft feel. And the size is just perfect without it being too big or too small. Something luxe to have in anyone’s collection. 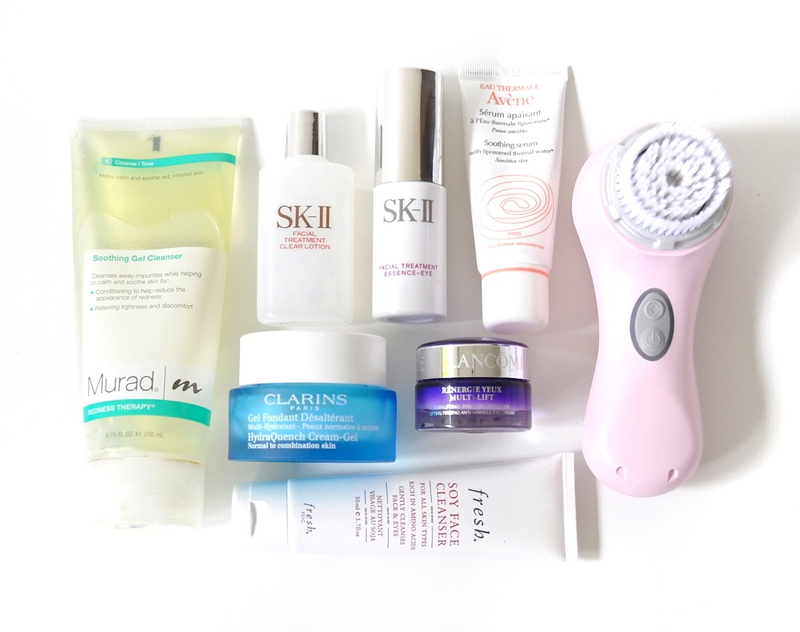 Here it is, the final entry for skincare week! I know I seem to have worked backwards as far as sequence goes.. but that’s how my world works! 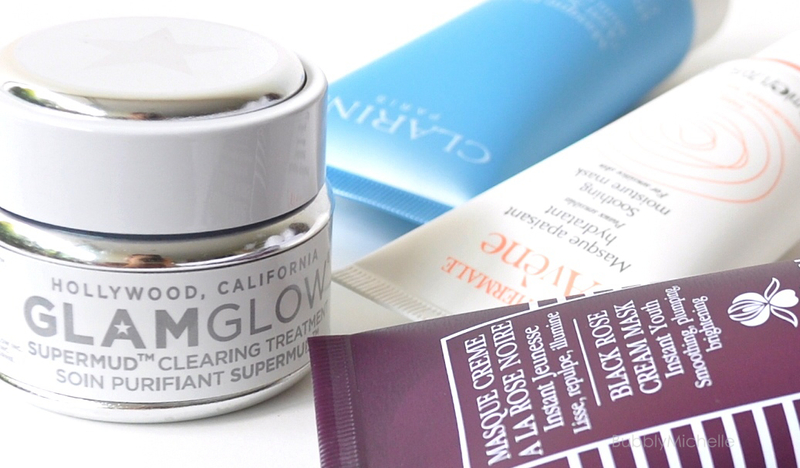 So this is going to be all about morning skincare. I basically keep it very simple and never really go overboard with any anti ageing skincare during the day time as I feel the benefits of skincare are delivered more effectively in the p.m, as skin repairs itself at night while we sleep. I normally start off with a mild cleanse, as there is no makeup or dirt to be removed. All a morning cleanser needs to do is take away last nights left over skincare (if any) and clear out any dead skin cells. For that I rely on this Murad one. Also around three times a week I sneak in a bit of Clarisonic action skipping my Murad cleanser for some extra deep cleaning and literally sweep away any dead cell buildup. I pair it with this Soy face cleanser by Fresh. During the a.m I like to use this Facial Treatment Clear lotion by SK2 which is a clarifying toner to refresh and wipe off dead cells and prep skin for the next step.. moisturizer! Moisturiser is something I take very seriously as my combination skin can be a real pain in the a** if not hydrated well and the dryer areas such as my cheeks can be especially uncooperative when I am applying foundation, and rebel with flakey patches. The key is to find a product that works great at hydrating as well as being light enough to not cause an oily mess on my t-zone as the day goes on. I really love the Clarins HydraQuench range for this. It hydrates but is light enough for the daytime. It’s also a great basic moisturizer that pairs well with most serums as it doesn’t necessarily have any specific anti ageing or treatment properties that may conflict with the serums that you may currently use. It has a lovely light texture, a refreshing soft smell and absorbs really fast. I’d highly recommend the cream gel version to anyone with oily or combination skin for effective oil free hydrating . Two thumbs up! In the mornings I choose light or lifting eye creams. I find that my regular night eye creams are too heavy for the day time and would cause my concealer to migrate and shift as it makes the under eye area very slick. 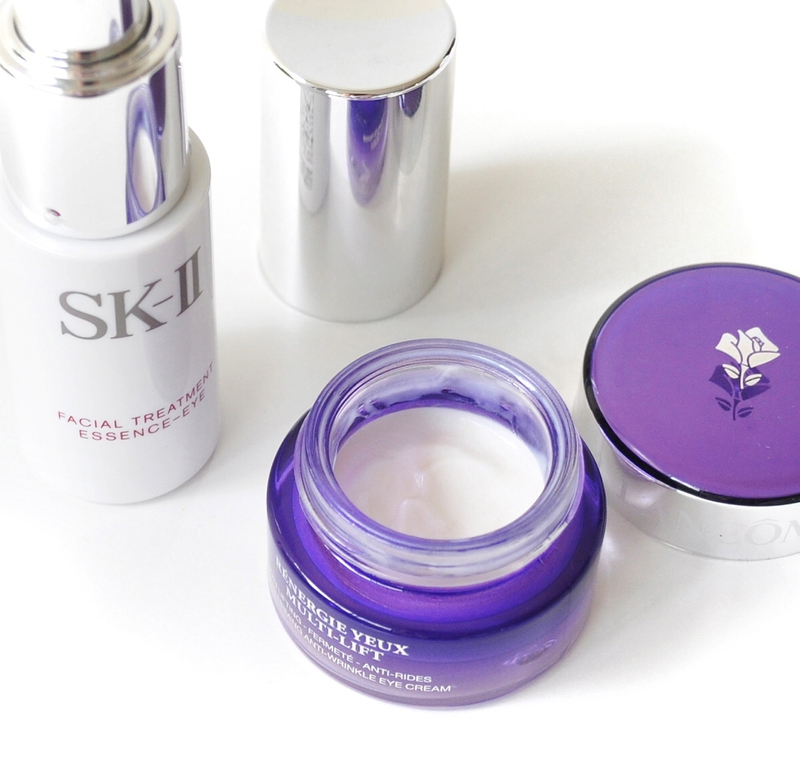 So the SK2 Facial Treatment Essence eye cream is perfect for that. It’s a very light texture and delivers just enough hydration to create a good base for applying any concealer. Another eye cream I really love for day time is this one by Lancôme. The Rénergie Yeux Multi Lift. I am so drawn to eye creams that lift the eye lid and deflate any puffiness. And in the mornings it’s essential to have depuffed under eyes to stop them looking tired. And this one is not too heavy and hydrates just the right amount. A big plus for me. 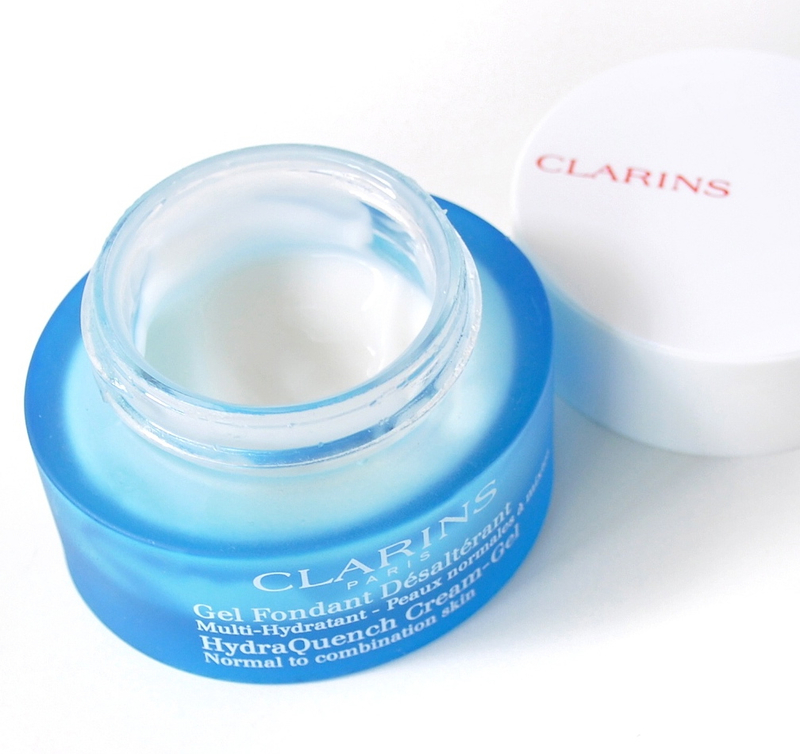 One more eye cream I really loved for it’s lifting action is the Clarins Defining Eye Lift. It instantly lifts up the eyelid and gives it a more youthful appearance. It also tightens the under eyes. Sadly I only had a sample of this and never really purchased it as it’s not necessarily hydrating enough to use on the whole eye area (it’s a runny liquid type serum). But I hope to purchase this in future as it did a good job as far as lifting goes, and I can use this strictly on my lids. With that, I conclude my a.m routine. Hope you found this post interesting. Face masks, the emergency rescue team of the skincare world. Apparently there’s a mask for pretty much everything these days. Be it an instant ‘lift’ for sagging facial contours, miraculous skin plumping anti-agers. And the best of all wrinkle relaxers! My weakness is hydrating masks and clarifying masks.. and can’t seem to get enough of them! I’ve used quite a number over the years and have arrived at these fab 5 that never disappoint. Usually masks are part of my morning routine.. I basically pop one on before I head to shower (which is after I have cleansed my face) and more often than not, it’s this Clarins HydraQuench. Once I am done showering I just wipe off the excess and go right into makeup.. I have never had a problem applying makeup over this (provided you do a thorough wipe), and it eliminates any chance of flaky spots and creates a good canvas for my foundation! This is also a great mask for a mid week treat too, the refreshing fresh fragrance of this is soo calming and helps with relaxation if you want to curl up in bed and catch up on some reading! The Avène Soothing mask is my savior when my sensitive skin decides to act up. This is great for moisturizing and calming skin that’s irritated. In my case when I am suffering from allergies and my face get’s itchy. I apply a thick layer of this and wait for about 15 mins and wipe it off. I always follow this up with my Avène Deep Moist Lotion which was discussed here. It helps with continuous hydration as well as takes off any residue of the mask, as I feel that foundation doesn’t spread as smoothly over this. This mask has no heavy scent, just the usual calming Avène fragrance if you are familiar with it. * Also note, it would also double up as a great treatment mask for sunburnt skin! Perfect for Summer. 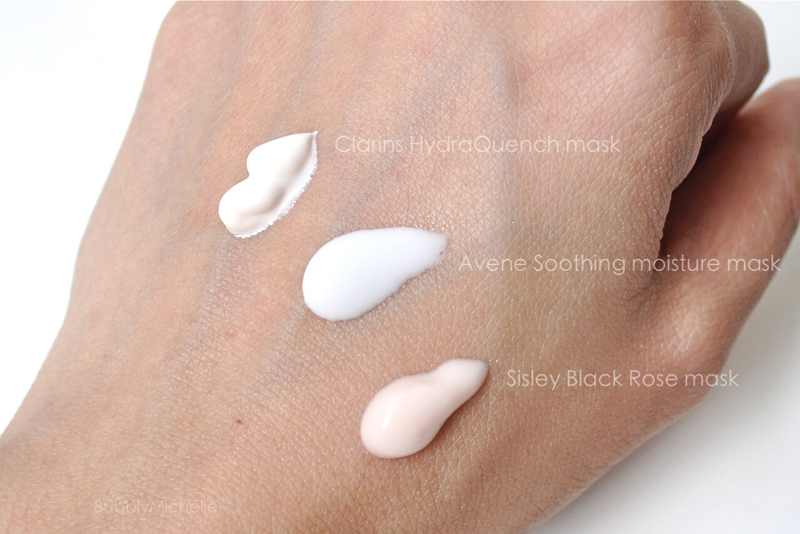 Sisley Black Rose mask is my weekly treat. It’s soothing rose fragrance is just what the doctor ordered for weekend pamper sessions. The second ingredient in this is Shea butter, which explains the intense plumping and hydration. It also contains Glycerin to hold moisture, and a tonne of other plant extracts to work on those anti ageing claims. I love that the scent of this is from rose flower oil, a nice luxurious touch, which is expected for the price you pay. The main benefit of using this is the instant radiance and plumping which helps iron out wrinkles temporarily, leaving my complexion looking glowy and most of all youthful! And the intense hydration is not short lived either, so that’s a plus as well. I usually don’t wear makeup after applying this, and only use it on afternoons when I have plenty of free time to relax and enjoy this to it’s full potential. 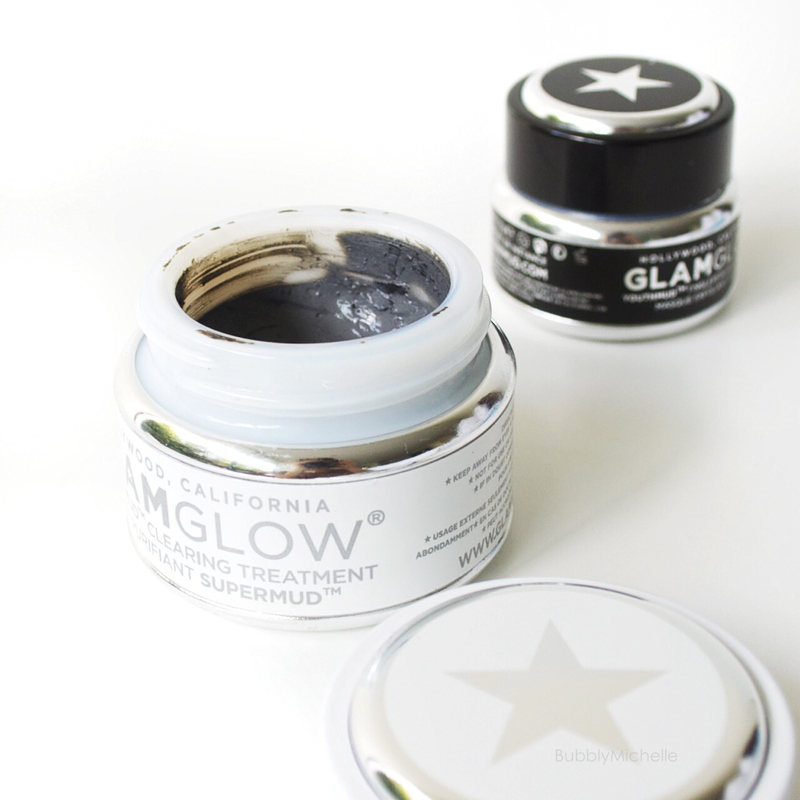 My absolute favourite clarifying mask is GlamGlow Supermud. It’s great for a good deep cleansing to get rid of any congestion and is also my go-to spot treatment! Just a dab of this on an emerging spot instantly calms it down and stops it becoming a big angry zit! Although some may find the earthy, herby scent a bit overwhelming, I don’t mind it. You can read more here. Now onto my favourite in-flight mask! 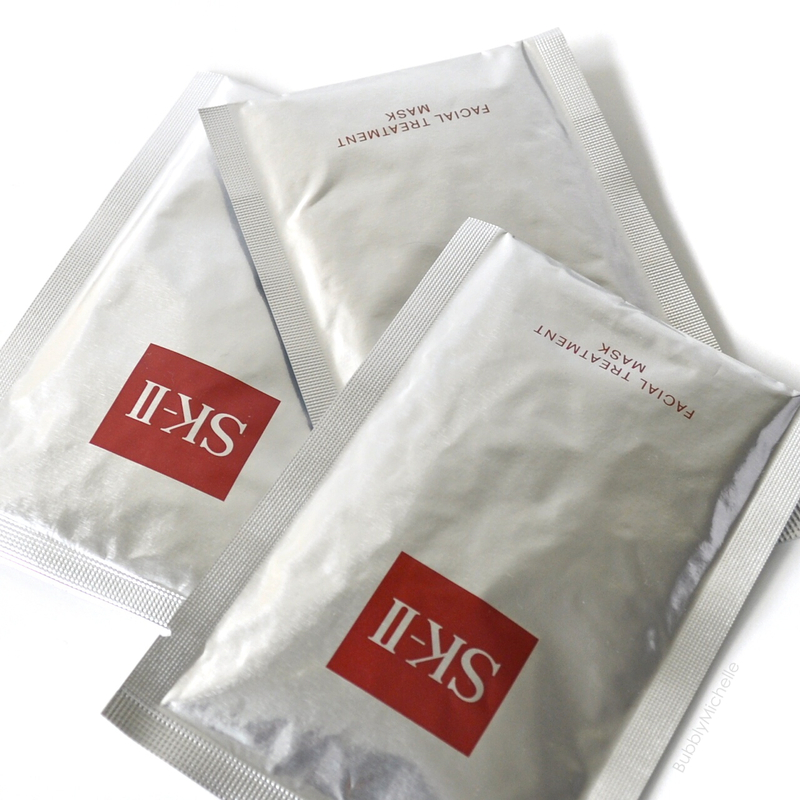 The SK2 treatment mask. Personally, not a big fan of sheet masks, but I always pack one of these for long haul flights as the dry cabin air can rob your skin of its moisture and radiance. Using one always allows me to disembark looking just as fresh as I boarded! They are generously soaked in Pitera enriched Treatment Essence which brightens and deeply hydrates. If you are new to these, the texture can be a little strange as it feels somewhat slimy.. but it’s something you eventually get used to. Bottom line, all these masks are pretty good. I would most certainly repurchase each and every one of them. However if I had to recommend just one. It would be the Clarins HydraQuench. It’s great value for money and a must try by the brand. The GlamGlow is also a great buy if you have acne prone skin. Although it’s on the pricier side, you get a lot of applications from a single jar so it lasts quite a while! Good value in my opinion. GlamGlow is available at Sephora and Tangs Orchard Singapore. Sisley is available at DFS Galleria and Metro Paragon Singapore. Clarins is available at all Clarins counters island wide. Avène is available at all Watsons outlets island wide. So today’s post is about my night time skincare routine. I have been meaning to do this for quite some time, but as the requests kept coming in, I decided to dedicate this week to covering my routines and new skincare which I’m trying without further delay. So the night time routine I am about to share with you is pretty much what I’ve been keeping to for the last 1 year with maybe just a few tweaks. Although just so you know, I do change my eye cream n my cleanser daily according to my needs at the time (as in I would use a richer cream if the skin around my eye is feeling dehydrated or maybe a cleanser for sensitive skin if my skins a bit irritated and red… so on and so forth). Now I am no expert in skincare, and these products I’ve selected are based on reviews I read at the time of purchase. Basically this me just sharing what has been working for me. To start with here’s a look at how my nightly skincare is stored. Everything I might possibly need is kept in this single drawer Muji box. And as you can see I have quite a little collection going on there 😉 But of course I don’t use them all at the same time! I am not that nuts, I promise! So as all routines go. I start with taking off my makeup. If you want more details on that i’d suggest you read my previous post, which was about all my cleansing and makeup removing lotions and potions. Then I move on to this new product, the Zelens PHA+ Bio Peel Resurfacing facial pad. Which is basically an acid resurfacing liquid. This I use in place of the old fashioned ‘toners’. Basically it is a daily exfoliating pad which is gentle yet effective and is suitable for use twice daily and lightly clears skin of any dead skin build up. As you may already know, skin absorbs moisturizer and serums better when there isn’t a thick layer of dead skin acting as a barrier. So a daily exfoliant is ideal to keep skin ready and excited to receive it’s anti ageing treatments. A little info about the genius scientist behind Zelens. Dr. Marko Lens is a plastic and reconstructive plastic surgeon who’s also renowned internationally for his work in the fields of skin ageing and skin cancer. He combines his knowledge in skin ageing and chemistry to bring this line of skincare which is high tech and prides itself on it’s clinical proof. And best of all his skincare is formulated without Parabens (which I’ll talk to you more about in a later entry). But for quick reference Parabens are basically preservatives which are now a dirty word in the world of skincare as it’s suspected to cause cancer. So yeah, I know. Important to slowly switch all my skincare to Paraben free products! So after I wipe my face with this, I then go in with a lotion. The Avène Deep moist lotion. And before I confuse you, this is not your everyday ‘moisturizing lotion’, it is more like an extra step before any serums are applied. Almost a hydrating toner (it’s a liquid, slightly ‘fuller/thicker’ than water) if you may. It’s designed to add moisture after cleansing. And I really love to sneak in an extra dose of moisture into my routine wherever I can cos dehydration is one of the main culprits behind premature wrinkles and fine lines. I love how this makes my skin feel super hydrated and supple. And since I have sensitive skin, I have come to love the brand Avène over the years. Another thing I must mention is that even though I have combination skin I never try to go crazy with oil control, more so in my night time routine cos it’s a known fact that oily skin ages slower than dry skin and I like to keep the natural oils going during the night to help my skin stay youthful.. Trapping moisture and keeping it there. That’s what the oil does! So I wont complain. On a side note, if you have combination skin and love that ‘squeaky clean’ feel after cleansing. Don’t! You need to keep your skin hydrated. So try not to overdo it with toners and cleansers that strip your skin. 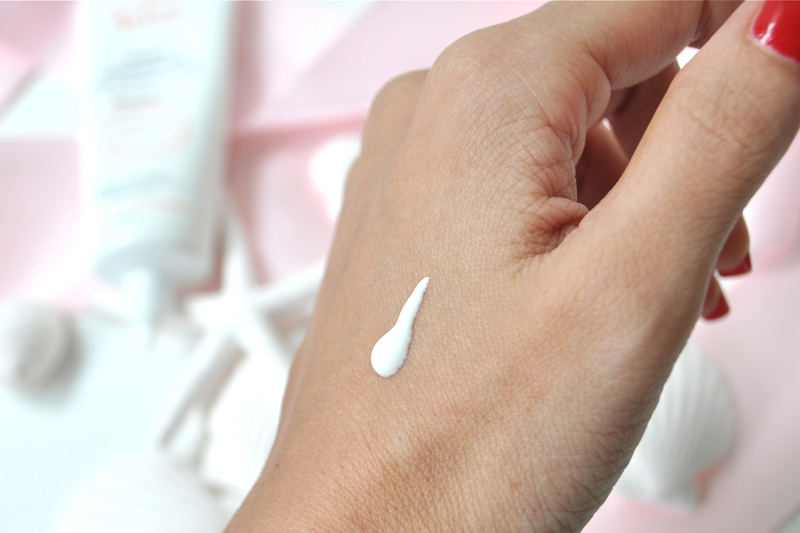 Although you might not realize, oily skin can get dehydrated too… And stay away from foaming cleansers! Unless you are a teenager, these are not for you. At least switch to a gel type, they are milder and don’t dehydrate skin as much. Bottom line, if your skin feels ‘comfortable’ and not tight after cleansing. Then you are using the best suited cleanser for your skin. If not, time for a change, opt for a milder version of what are currently using. So back to the routine, the application of Avène lotion was the last step of my prepping. Which I understand is a bit of a process as you read it, but in order to allow better penetration of my serums and moisturizer it’s a necessary sequence that can’t be skipped (it all only takes me about 2-3 mins max!). My power duo when it comes to serums is by Lancôme. I have become so attached to them that it’s a bit scary. 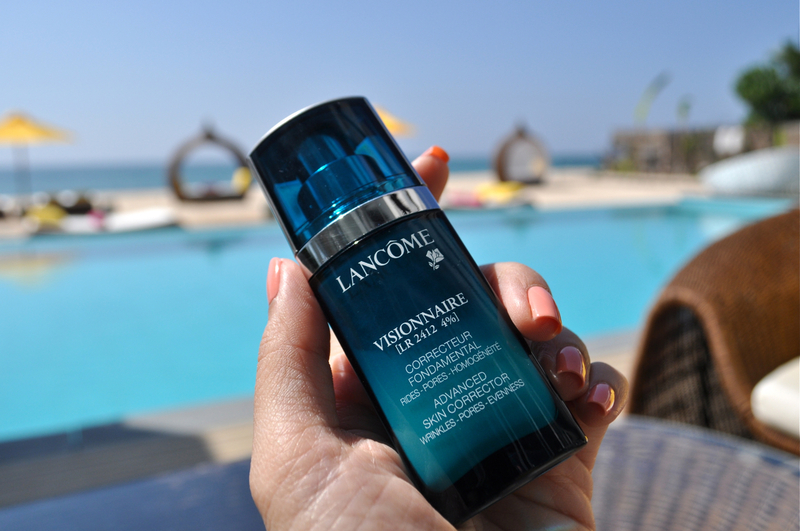 Nothing makes my skin look radiant and supple like the Lancôme Visionnaire serum. I have been using this for years (and was recommended by the lovely Alex to whom I’m forever grateful). Recently I added the Advanced Génefique Youth Activating Concentrate to the mix. All thanks to the super kind folk at Lancôme Singapore who sent me a load of the Génefique line to try out which I am slowly incorporating to my routine. It’s a bit too early for me to comment on how this combo works but I will definitely do a separate post on just these two when I feel the time is right. The last step of my routine is eye cream. And all I can say is, it’s a never ending quest for the right one…. So far I have found a few that work well. Namely this lovely one by Shiseido, the Bio-Performance Super Corrective Eye Cream which I LOVE for hydrating and general anti aging. It’s what a sip of water is to a man lost in the desert. I only use this when my eyes feel tight or tired and I wake up with my eyes feeling refreshed and alive! If you don’t have major wrinkle concerns and mostly dryness issues with anti ageing, GET THIS ONE. It’s amazing. But of course I am on the look out for heavy-duty wrinkle killers so I settled for this Sensai cream that’s said to have rave reviews and was recommended to me by a SA at Neimans. I’ve been using it for a while now and I can’t really say it’s doing a fab job. But it’s been only like two months into using this, so I wont trash it. 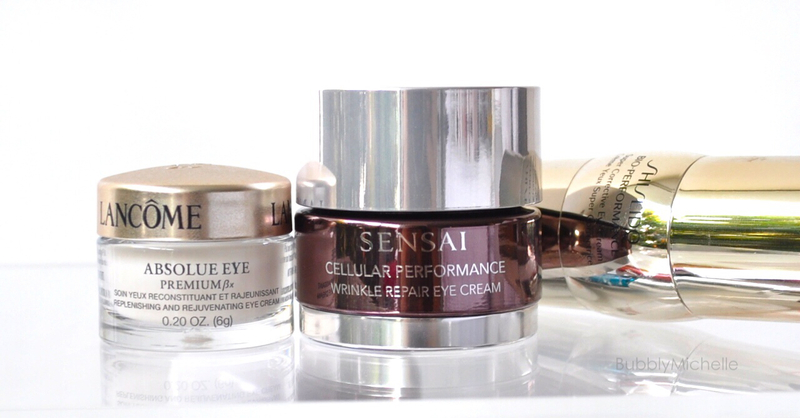 Eye creams take time to work. Also should note, this is loaded with Parabens…. Sigh. My third eye cream is the Lancôme Absolue Eye Premium, which was a GWP I received when I was in San Francisco. Although the SA recommended this for mature skin, I like the consistency a lot and it’s a good hydrator. Also it’s from Lancômes premium line, and I get a bit excited trying expensive things! So those are the three I keep in rotation for my night time eye care. let me know your thoughts on the whole ‘toning’ and peels etc. I would love to hear your opinions. And also if you have any tips of your own! And as always don’t hesitate to ask me any questions that you may have about this post.